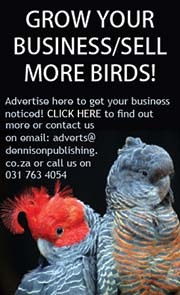 Please email us on adverts@dennisonpublishing.co.za if your contact details have changed or if you would like to be removed from this list. Description: Private breeder of Caiques,doves,Solomon electus,Galahs, Australian finches, Splendids, Turquisines, Kakariki’s,Ringnecks, Love birds and Canaries. Wide range of finches and canaries. Description: We are one of the most reliable oldest, largest leading manufacturer, exporter and importer of live exotic birds, all pet products and Table BarBeBue hotel ware. Description: Canary Breeder: Red Factors, North Dutch Frills, German Rollers, Fifes, Glosters, English and Lizzard Canaries. Bengalese finches, grass finches, star finches. Description: Whooper swans, blackneck swans, mutes, black swans. Description: Birds is my life. Description: We specialise in Red-crested Cardinals and Madagascar Lovebirds. Keep most Australian Finches. We also specialise in Zebra Finch mutations and Show Zebras. Description: I am looking for Macaw and Cockatoo birds. Two pairs of each. If you have a export license and can deliver for me to Tanzania let me know please. Description: I have a passion for all the Africa Parrots and have these in my collection, the collection however mainly consist off a mixed wide range of birds. Description: I only breed rinknecks. Description: BREEDERS OF EXOTIC PARROTS FOR PET HOMES AND FOR BREEDERS. Description: BREEDING RINGNECK MUTATIONS JUST SIMPLY STUNNING. Description: Beautiful common and show budgies, lutinos, pieds, dilutes. Description: Breeder of various hookbills. Hand raise various parrots, cockatiels etc. for the pet trade. Also provide sanctuary to pre-loved birds. Description: Registered breeders and Hand rearing of exotic parrots. 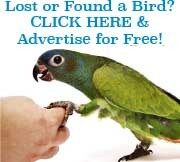 Description: I rehabilitate and work with any rescue parrot that may come my way. A breeder of Lovebirds, Cockatiels, Ringnecks, Senegal and Grass Parakeets. Description: Private Breeder Specializing in Blue Fronted Amazon & Macaw. Description: Breeder of mutations in Lovebirds, Red rumped parakeets, Elegant Parakeets, Bourkes Parakeets, Cockatiels, Eastern Rosellas, Celestial Parrotlets and Pineapple Green Cheek Conures. Description: Please feel free to contact me or at me on WhatsApp (084 5500 600). I have a WhatsApp Group for lovebird breeders too if you would like to be added please send me a message on WhatsApp with your name and location. Description: You Looking for a pet that can be great company and bring joy. I hand rear Cockatiels. As a Hobbyist Breeder, have started out. I put great care in the health and happiness of my birds. 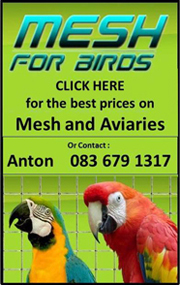 Also on offer: Food, Building cages and Aviaries and Nesting boxes for your Cockatiels. Bigger cages can be built for your big parrots too. Have a look on Cockatiels – The Loveable Pet Warehouse. I could get other birds for you too if you are in search. Description: Only rare or endangered finches. I have a 6m x 3m 2m avery with natural water, grass and acacia’s and the enviroment is 100% natural. If they breed its because they want to, I hate bird without a mate !! Description: Galahs, Blue Fronted Amazones and African Grey parrots. Also common Ring Neck mutations. Description: Parrot breeder situated in Ladismith Western Cape. Description: Breeders of parent raised birds. Description: I am a bird hobbyist. The birds I keep are Yellow, Pennant and Golden Mantled Rosella’s, including Turquoisines and canaries. Description: Specialize in Yellow nape, Double Yellow, Blue Fronted Amazons as well as Macaws and Cockatoos. Description: Small farm with a variety Macaws, Cockatoos, Parrots, Parakeets and Lovebirds and Poultry mainly Orpingtons and Pekins. It is a breeders collection. Pictures available on Facebook. Description: Poultry :minorca/polish/orpington; Free State Poultry Club, manufacturing rings for poultry and birds. Description: Few Tame Cockatiels Available to Sell. Contact me if interested. Description: Variety of birds. Whatsapp/call for more info. Reasonable prices, always willing to help with info where needed. Have a feathery day. Description: I specialize in breeding green wild-type black-cheeked lovebirds in colonies in large aviaries. Description: Collection of 250 breeding pair of various African Parrots. Description: We breed Cockatiels, Quakers (Monk Parakeets), Greencheek Conures, Black Capped Conures, Blue Headed Pionus, Bronzewing Pionus, Orangewing Amazons, Hahns Macaws and Celestial Parrotlets. Description: We breed African Grays on a small scale for the pet lover, with care and lots of love. Description: Breeding and handrearing Congo grey, Timneh grey, Sun conure, show and crested budgies. Description: I am breeding with Lovebird, Greys, Amazones, Ringnecks, Conures. Description: Lovebirds, Roicecollis en Fishers Quakers, Goue mantel en African greys. Description: BREEDER OF ALL FINCHES, AUSTRALIAN,GOULDIAN AND AFRICAN. BUILDING OF ANY SIZE AVIARIES FOR BIRDS, PIGEONS,PARROTS,AND OTHER ANIMALS, AND DESIGN BREEDING CAGES TO YOUR SPEC. SOURCING OF BIRDS. BUILDING FEED STATIONS FOR ALL ANIMALS BIG OR SMALL. Description: Specializing in all the Gouldian colours. Description: I am a breeder of lovebirds. Description: Looking to import Parrots to Saudi Arabia in big quantity. Please, contact me as soon as possible. Description: We breed African greys, variety of macaws and eclectus. Description: Wanted – Exotic bird exporters to supply monthly birds to Qatar. Various exotic species. Please email me urgently. Iam the direct buyer. 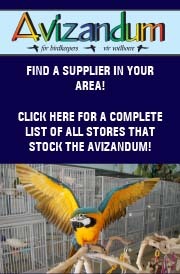 Description: We breed Scarlet Macaws, Blue&Gold Macaws, Dyh Amazons, Cuban Amazons, Blue front Amazons, Galah Cockatoos. We import also looking for exporters who can export Macaws, Cockatoos and Amazons to Pakistan. Company Name: Lahore Maktab Trust Aviaries. Description: We are breeding mutation finches and successfully have developed quality sizes and unique sharp colours using exported Avian vet recommended vitamins for our birds. Description: Looking for hand reared Yellow Naped Amazon auropalliata will take good Qty.